It’s crazy insane to think next week is already July. That means summer break is 1/3 over. That means our big family vacation is coming soon! Which brings me to my next request. We are planning a big cross-country vacation. Driving. For three weeks. In a car. With 4 kids. I know, I’ll need lots of coffee, movies, books, games, etc. But here is my request: I’m trying to come up with some fun goodies to give the kids as we enter each state. I’m thinking for the younger kids there will be word searches and bingo games. But I need more ideas. So…here are the states we will be driving through: Indiana, Illinois, Iowa, South Dakota, Montana, Wyoming, Idaho, Oregon, California, Arizona, FOUR CORNERS, Colorado, Kansas and Missouri. If you live in one of these states could you help me? Tell me something unique. Is there a treat that was made in your state (for instance, if we were going to Pennsylvania I would give my kids some Hershey bars in their goodie bags). Is there a movie (that is appropriate for any of my kids…aged 9,11,14,16) that highlights your state and you think we would enjoy watching it. I look forward to reading all your comments. Let’s get to this week’s roundup, shall we? Most Drool Worthy Photo: I’m sorry to be so blatantly self promoting here, but this week a bunch of my fellow bloggers (and myself) shared some copycat Gourdough’s donuts from our BlogHer Austin trip. I can’t get these doughnuts out of my mind. Did you see how amazing they all looked??? 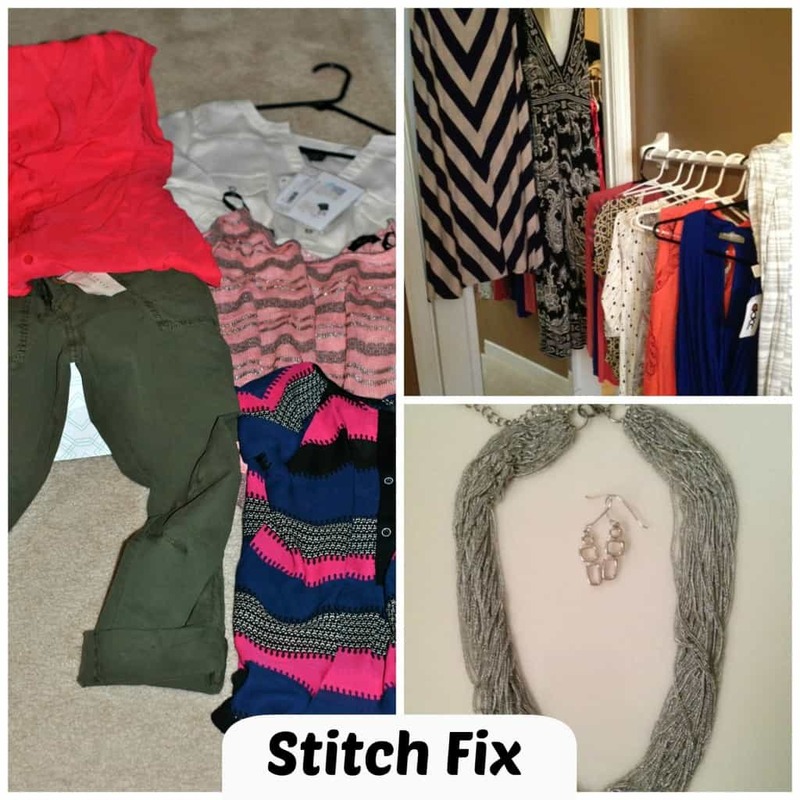 I’m Lovin it: I’ve mentioned StitchFix before, but I’ll say it again. I’m in love. I have now had 4 fixes and have kept almost everything sent to me! If you’ve never heard of Stitchfix, it’s a program that you sign up for and fill out a style profile. From there, you get a personal shopper who will choose 5 unique boutique clothing and accessories for you. You specify how often you want these items sent (once, once a month, your choice!!). You can keep everything (save 25% on entire order) or return the items you don’t like. Your $20 fee is applied to your order. So unless you return everything, there’s no risk. You keep the items, try them on in your own home, pair them with other clothes you already own and decide within three days if you want to keep or return your items! Seriously, it’s very cool. I love wearing the clothes that I know not everybody just purchased. And since I hate shopping for myself, it’s perfect. Here’s a little collage of some of the items I received. I’m not so good at styling the photos, but you can see all the awesome colors! Items I would probably have never picked out in the store, yet look amazing and fun!! 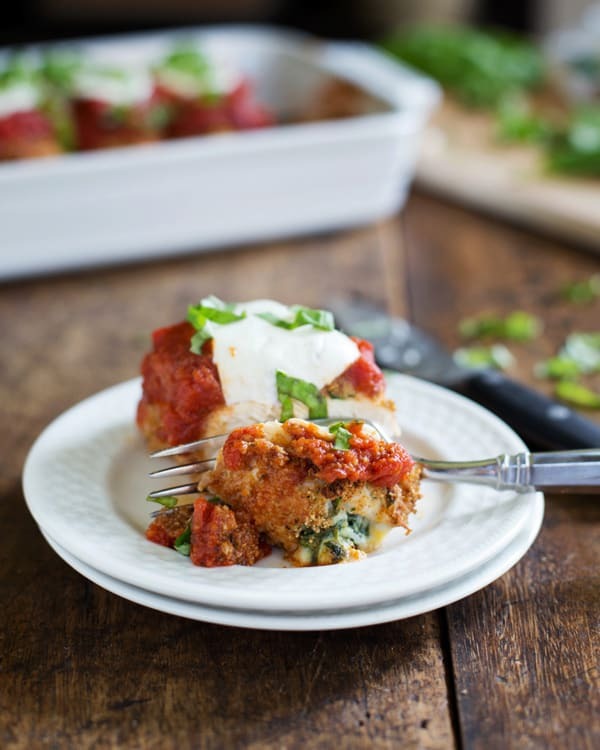 Dinner Inspiration: These Baked Mozzarella Chicken Rolls are on my menu for next week. Of course they are gorgeous, because Lindsay at Pinch of Yum is an awesome photographer (see the Tasty Food Photography link on my sidebar)! But just the ingredient list screams, MAKE THIS AND EAT. Do you hear the screams too when you look at the photo? What’s New: So I saw this 30 Day Plank Challenge on Instagram and our family has taken the challenge. We are on Day 6 today (rest). I’ll be honest, it’s tough. I try to do the plank 3 times a day, just to build up my ab muscles (after 4 kids they are a tad on the weak side). I can’t imagine getting to 5 minutes, but we are going to do our best! Plus it’s fun to do this as a family!! Will YOU take the challenge? Very Pinteresting: Does anyone else struggle with side dishes for dinner? I can have a great main dish planned, and then when it comes to making the side dish we usually end up with some frozen veggies or a salad. I’m not good at creating something delicious (unless of course you count this Gouda Mac and Cheese, but we can’t eat that every night. Right??) Check out my Salads and Side Dishes Pinterest Board. 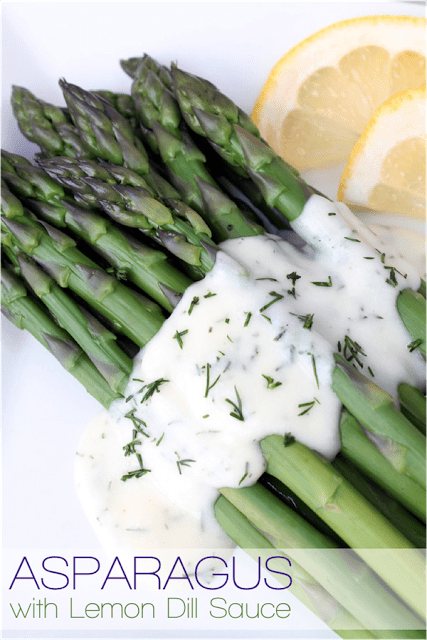 There are some delicious ideas like this Asparagus with Dill Sauce. YUM! Most Popular on Shugary Sweets: This week was fun. Not only did I share some Apple Pie Doughnuts, but you also got a recipe for Funfetti Cookies and Skinny No Bake Cookies. However, while those recipes are all delicious, none of them were the most popular on the blog this week. AND, my Reese’s PB Dip got knocked down to NUMBER 2 as well. 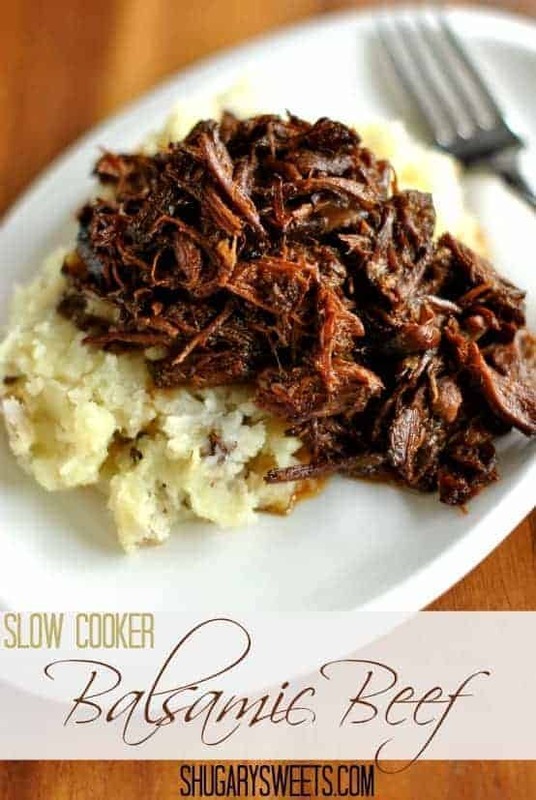 This week’s most popular recipe was my Slow Cooker Balsamic Shredded Beef. 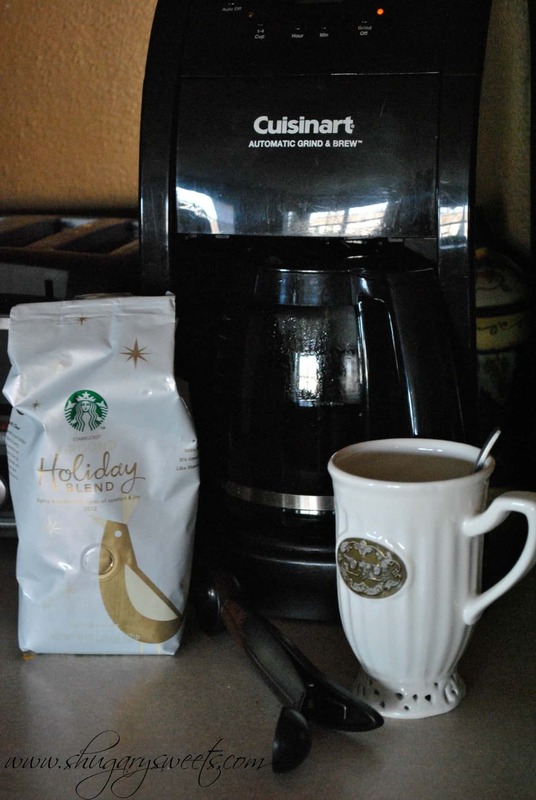 If you haven’t tried this recipe yet, get it on your menu!! You will be happy you did. Plus, it’s a slow cooker recipe. EASY PEASY. 1.) organize your follows into lists (brands, bloggers, friends, etc) That way you can see what you want to see! 2.) Don’t just share links. Start conversations!! 3.) careful when you autoschedule tweets. When something big in the news happens (think Columbine) nobody wants to hear about your “best cupcake tutorials.” Tacky. So that’s my list for you all! Don’t forget to help me with my vacation planning….I can’t wait to read your ideas!! Don’t forget, Google Reader is going away on Monday, so if that’s how you follow me be sure to connect in other ways! **Some links in Coffee Time posts may include affiliate links. There may be products featured that have been provided for review. No other compensation was received. Please see my Disclosure Policy for more information! My in-laws live in Iowa, and I know they are famous for the Bridges of Madison County (the movie was filmed there) and the Field of Dreams (the movie). You can visit both while there! Field of dreams, YES! Thanks for the reminder on that one! Stop at Dyersville for the Field of Dreams – you won’t regret it! And while you’re in Dyersville, grab lunch at the Country Junction! They have the best pie!! So I don’t live in one of those states so I’m not sure I would be a big help when it comes to goodies but I do have a game recommendation. The travel size catch phrase game is so fun! We play it in the car when we travel and you can do teams so that would help with the smaller ones. 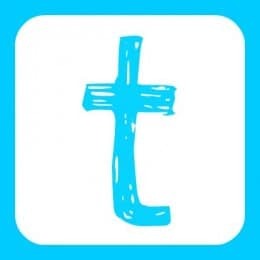 My question for you is how important is twitter to a blog? I can’t imagine adding another social media button to my day! Definitely important. It’s a great way to connect with people. ESPECIALLY with brands! Also, fun to send messages directly and share things you love! The more I use twitter and become comfortable with it, the easier it is to use…. I’m a Nebraskan, but if you are traveling through Iowa you must try Palmer Candy CO., Twin Bing candy bar. The “Twin Bing” is two mounds of chocolate/peanut mixture with a creamy cherry filling. They are delightful. Bings are my kids favorite candy treat!! You can also try, Blue Bunny Ice Cream which is also an Iowa treasure. Robin, thank you! Exactly the kind of treat and info I’m looking for! If you try the Twin Bing, then you also need to try the Cherry Mash from Missouri. It is a chocolate, peanut butter, nutty coating over a cherry filling. They are from the Chase Candy Company out of St. Joseph, Missouri. I’m from Kansas (lived in Missouri for 6 years), and I cannot really think of any treats from Kansas, but you could always show the Wizard of Oz on your trip. Stop it! No talking about Christmas shopping yet! Oh gosh, good luck on your road trip! As much as I love my husband, I don’t think I could do three weeks in a car with him, not to mention with 4 kids, haha. Sounds like it will be a fun experience for all though! And aren’t those doughnuts killer? I want them all. Yeah, we’ll see how we all fare, should be…interesting! Will you be in the San Francisco area? Sourdough bread, salt water taffy, or Ghirardeli chocolates come to mind. Can’t think of any movies…ugh! I need to check out stitch fix…sounds intriguing. I’d love a personal shopper! I do planks, but I need to do them daily. I saw this challenge and I’d love to try it. Oregon: the movie Goonies and eat at Burgerville when you’re in the Portland/Vancouver area. Goonies, good call! So helpful, thanks Sarah! I live in Oklahoma but I have some suggestions for Kansas. Sunflower seeds and the movie, Wizard of Oz. Sounds like a blast! Have fun!! Sounds like a fun trip! I’m originally from Ohio, so I don’t have any recommendations. But, I do remember a couple of trips like that with my family from when I was younger. They are some of my favorite memories! We are really looking forward to it Kathy!! I am from GA so I am no help. I did here the other day that PA is the founder of pretzels and that the hard pretzels happened because they got over cooked. When tasted they loved them so they were born. Sorry I thought I saw PA on your list. DUH!!!!! I have heard of California raisins. I’m from Indiana. A movie I would suggest is “Hoosiers.” For their treat – Popcorn! Orville Redenbacher is from Indiana and a lot of popcorn is grown there. Have a fun trip. Indiana: Sugar cream pie! There’s also the South Bend Chocolate Company which has outlets throughout the state. I’ll definitely check in to the chocolate company!! Thanks! Hmm…I live in Arizona and everything prickly pear flavored (jelly candy, lemonade, etc) is a big deal, but those gross lollipops with scorpions in the middle are REALLY popular! Car food is hard! Churros are everywhere and Sonoran hotdogs are our region’s specialty, as is our carne asada, but those might be difficult to stick in a snack bag for the car. 😉 You could do more of a cutesy play on the state with something like Hot Tamales, though! 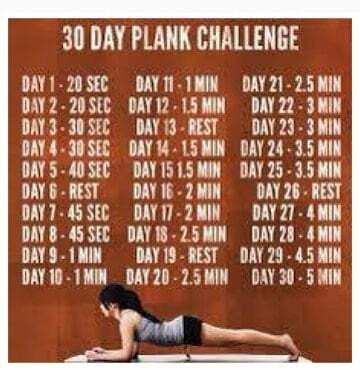 I really need to do that 30-day plank challenge! And man oh man, that balsamic beef – AMAZING! Just added that to my to-make list! I live in Missouri and I would suggest Russell Stover candies and/or some frozen custard in an ice cream cone. Ice cream cones were invented at the St. Louis World’s Fair in 1904. I live in Utah, and although you didn’t mention it specifically, we are one of the four in the Four corners. Did you know that KFC is a Utah company? Seriously, the first franchise opened here in Utah in 1952 and the original building was actually running up until 2004. So many people don’t know that! Even if you don’t visit us specifically, you will if you stand at the four corners! Just thought of some other treats from SD. If you are in Wall Drug, SD You must stop for their gigantic doughnuts!! They’re huge and tasty. They also have a large cafeteria with yummy hot beef sandwiches. The ice water is free and coffee is 5CENTS!!! It is a great people watching area and if you’re in the mood for some cowboy boots they have a large selection of cute ones. If you will be staying in the Rapid City area than I suggest the Circle B Chuckwagon cowboy dinner. Our kids, 11, 15, and 19 loved it. You eat dinner cowboy style and they have live entertainment. You have your choice of bbq chicken, beef brisket or buffalo roast with baked potatoes, cowboy beans, applesauce, homemade biscuits and spice cake for dessert. They have a wonderful raspberry honey for the biscuits which they also sell in the gift shop. halfway through the dinner they start passing out extra biscuits… as in throwing them to you from across the dining room. The kids loved it. They have beautiful quilts decorating the rustic dining space. everything about this place was great!! Ah, CA. My state. Let’s see…Full House (Jordan is loving that show right now) takes place there, so does Mrs. Doubtfire. Jelly Belly has it’s tour/factory in Fairfiled, which you may drive through. Depends on how you come down from Oregon. If you’re on 101, no, but if you’re on I-5, you may. So jelly bellies are a good snack. Sourdough or Ghiradelli. And if there are any fun books or activity pages on crabs or sea lions, that’s good for SF. I’ve only lived in CO for 2 years now, so I’m not really sure what to suggest. But if you are driving in from a side where you are coming in over the mountains (when we moved here we drove up through NM from TX) and the view was so spectacular that we almost had to pull over to take it in. I completely forgot to take pictures and I had camera in hand lol! I’m actually from New England, so its not like I’ve never seen a mountain range, but that was really a beautiful sight. I was born and raised in Montana and you MUST go visit Glacier National Park. It is absolutely beautiful. I highly recommend taking a Red Jammer Tour along the Going-to-the-Sun Highway. Also, please visit Columbia Falls (maybe an hour from the park) where you will find the best breakfast and coffee place-Montana Coffee Traders! You will not be disappointed. And your kids would really enjoy The House of Mystery located between Columbia Falls and Hungry Horse. I live in South Dakota and have a couple of suggestions. Probably the most well-known movie filmed in South Dakota is Dances With Wolves. If you visit the Black Hills and Mt. Rushmore, (and I hope you do!) you can visit the film set at Fort Hays Old West Town, which is just a few miles from Mt. Rushmore. I believe admission is free. If you are there overnight, they have a really fun live Cowboy Music Dinner Show. My other thought would be Black Hills Gold Jewelry as a lasting (if somewhat expensive) souvenir of South Dakota. There are several outlet stores in and around the Rapid City/Black Hills area that have good prices on very nice pieces. You will find it readily available at many other places as well, pretty much any jewelry or tourist shop in the state. It’s very pretty and unique to the Black Hills. Have a fun trip! You will certainly make many memories along the way. If you were coming to Wisconsin, I would have you covered for sure 🙂 Sounds like a fun trip! Here’s a few Kansas tips for your trip…. Pizza Hut was created in Wichita, KS by two Wichita State University students. If you are traveling on I 70, between mile posts 17 and 19 you will pass by Goodland, KS where you would find our Museum showcasing the First Helicopter, near by you could see one of seven (in the world) replicas of Van Gough’s Sunflower Paintings on a HUGE Outdoor Easel and just a stones throw from both the Museum and Van Gough you could grab lunch at a Pizza Hut. It’s a tiny little town but we’ve got some treasures. Marvelous Know-how, with thanks. With regards to employees which usually want to get slimmer quickly, check out our website for the preferred process to burn extra fat in a flash.